Here is a list of carrot recipes on this website. Carrot, a tuber vegetable, is a very versatile vegetable. 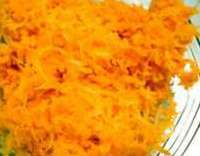 This list includes sweets, salads, chutney, curry recipes using carrots. Carrots are known as gajar (Gujrati, Hindi, Marathi), carrot / gajjari (Kannada) etc. in Indian languages. Carrots are used in many shapes such as sticks, julienne, slices, diced, chopped fine, grated etc. as you can see below. Here are some carrot recipes for you.